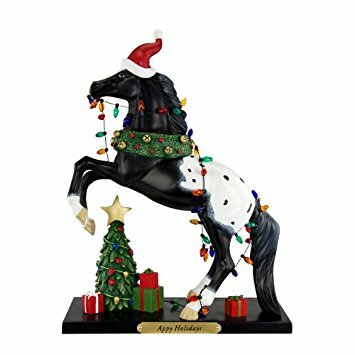 Appy Holidays | Retired Ponies Figurines | One Price Low Flat Shipping! 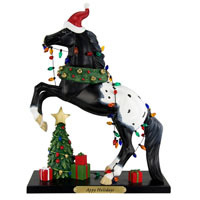 From the Painted Ponies 2011 Holiday Collection, Appy Holidays. This is a first edition version from the first 10,000 produced as designated with the 1E serial number prefix. Designed by artist, Jennifer MacNeill-Traylor. Made of hand-painted resin. Measures 8" tall. New with all original packaging. Donning a Santa hat this appaloosa pony is going to deck the stalls with a string of colorful lights, festive wreaths, and gifts for all his horse friends. In Appy's display of gifts and holiday festoonery, he is rearing up to reach hard-to-get-to places!